So last week, the American Idol season 12 top 10 were revealed to the public. From 10 boys and 10 girls who performed for the audience’s votes, only 10 remained. 5 boys and 5 girls were chosen by the public in yet another new twist to this year’s season. Not only that, each selected singer was given an opportunity to sing a victory song. It’s the opposite of that dreaded farewell song whenever a contestant is eliminated. Aside from this new round, the other new flavor is called the Sudden Death Round challenge which led to the selection of the top 20 who performed live for America’s votes. So what do you think of this year’s top 10? As for me, the results are both disappointing yet exciting at the same time. There were 3 contestants I like who didn’t make it to the list. Adriana Latonio is one. Although she is a Filipino pride, it’s quite understandable since she is young and is considered among the minority in the U.S. She didn’t gain enough votes to make it to the top 10. Nicki Minaj is right to say she should consider this as an experience, practice more, and come back next year. Her performance sounded pageant-y indeed but not without talent. She is talented but just happened to be too young to battle it out with the other finalists. Another disappointment is Cortez Shaw, who was not included in the list too. Cortez’ music is timely despite his outfit being a bit outdated. That part can easily be fixed. Too bad the show won’t hear his pop song renditions anymore. With the judge’s not too positive comments on Adriana and Cortez and both of them were eliminated, it makes me believe that the judge’s say does impact the turnout of votes in a sense. The same applies to other contestants who performed well on stage but not on the judge’s eyes. Lastly, looks like Zoanette Johnson isn’t as popular as her phenomenal voice deserved. I thought she would be among the top 5 at least with her inspiring story and her unique singing style. So it’s another tsk…tsk… right there. What excites me at least is the fact that most of the chosen top 10 are worthy to be there for the inspiration they will bring to viewers and of course, their singing talent which will wow us every time. left to right: (upper row) Lazaro Arbos, Amber Holcomb, Paul Jolley, Curtis Finch Jr. Among the ladies, Kree Harrison and her effortless belting out, is a contestant to watch out for. The same applies to Angie Miller and her well-rounded musicality. For the gents, Devin Velez offers a unique flavor with his Spanish/English rendition; Curtis Finch, Jr. humbles us with his heavenly worship leader style of singing; and Lazaro Arbos, who stumbles while speaking but sings in straight verses is an inspiration. Check out photos of the top 10 through AmericalIdol.com here! 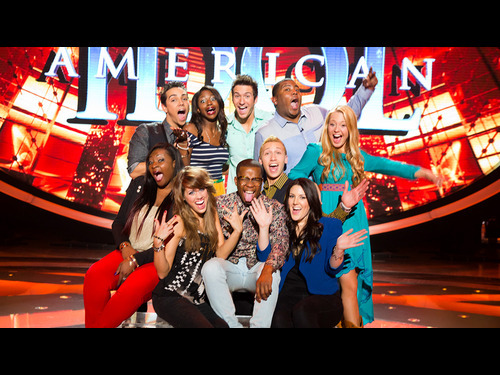 Watch out for the American Idol season 12 top 10 performing live for your votes this week!